Since women wear jewelry more often than men do, they need a watch that will go well with whatever jewelry items they are wearing, which makes the more delicate bracelet watches for women extremely popular. Many women own at least two bracelet watches, one for casual dress and one for when they need to dress a bit more formally. Still other women purchase a number of inexpensive watches that they change almost as often as they change their necklaces or earrings. For 50 years, The Arminton Company has been making high quality and precision time pieces. The Armitron Women’s Silver-Tone Diamond Accent Bangle Bracelet Watch is a high quality and beautiful watch with great features that will appeal to many different women. The Armitron Women’s Silver-Tone Diamond Accent Bangle Watch is an extremely elegant and sophisticated timepiece. The sapphire blue on this watch makes it even more attractive and elegant looking, while the small diamond gives it that bit of bling. Reviews for this watch are extremely positive, with most women being thrilled with this watch, whether they purchased it themselves or received it as a gift. There are a few isolated complaints about this watch not keeping time, but most of the customers did not feel this was true and felt the watch did keep good time. This elegant and stylish women’s watch made a positive impression on those who bought it. For 40 years, Anne Klein has been considered to be a top notch designer of women’s fashions, whose designs are well known for their style and class. The Anne Klein Women’s Swarovski Accented Two-Tone Chain Watch is part of this designers line of accessories. 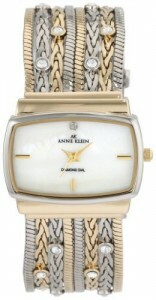 This Anne Klein watch seems to be a great watch for women who like larger and bolder watches. The fact that this watch is two-toned will make it possible to wear this watch with a wider choice of other jewelry. Reviews for the Anne Klein Swarovski Crystal Accented Two-Tone Multi Chain Watch are exceptionally good, with the only negative review seeming to be due to a mix-up in the order rather than any problem with the watch itself. This Anne Klein watch is very popular with customers who find it more than meets their needs. The Timex Company is perhaps one of the most recognizable names when it comes to watches. This company is known for its affordable and extremely dependable timepieces that in many cases last years and can take a ton of abuse. The Timex Women’s Elevated Classic Dress Sports Two Tone Bracelet Watch is just one of the many watches this company has to offer. This Timex watch for women is a more casual and sporty watch that is highly functional. The stainless steel watch with gold accents makes it possible to wear this watch with almost any piece of jewelry in your wardrobe. Reviews for this watch are very positive, with the main complaint about this watch from some customers being that the band is quite large for many women’s wrists, which might make it a better option for larger women. The majority of customers were really impressed with this women’s watch from Timex, and loved how it looked and felt on their wrist. Bulova designed and sold its very first line of watches back in 1919 and has been a leading manufacturer of watches since that time. This company was the very first company to introduce the electronic watch to the world, thus creating a new niche in the world of time. The Bulova’s Women’s Bangle Bracelet Watch is just one of the many watches this company manufactures. The Bulova women’s watch is a truly elegant and beautiful watch that any woman who wears watches would love to own. The two-tone metals in this watch make it possible to wear it with either silver or gold jewellery, and it is sophisticated enough to wear with formal attire. Reviews for this Bulova Bangle Bracelet Watch are outstanding. Overall, customers really fell in love with this beautiful Bulova watch and felt it was very stylish and elegant. 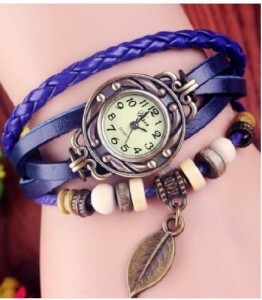 For women who like to change their watch as often as they do their other jewellery, the WAWO Quartz Fashion Weave Wrap Around Leather Bracelet Lady/Woman Wrist Watch comes at an extremely attractive price, allowing you to buy a dozen different colors and styles of this watch for the price of a single watch from most other companies. This is a fun watch that is designed for casual wear and provides a sense of style to the old tried and true bracelet watch. Teenagers and even pre-teens would enjoy finding this inexpensive watch in their stocking on Christmas morning, or enjoy receiving a set of different colors and styles as a gift. There are only a handful of reviews for this watch, but the reviews that are available are good. Of course, it really is going to depend on what you expect from a watch that is so inexpensive. If you expect it to last as long as that $100.00 or even $40.00 watch, then you will probably be disappointed. If however, you purchase this watch knowing exactly what it is, then you will be pleased with your purchase, as most of the customers for this watch were. This is a funky, unique and eye-catching watch at a really impressive price, which the majority of customers really loved. If you are looking for an inexpensive watch that still looks elegant, then this Fashion Round Face Bracelet Bangle Wrist Quartz Watch may be right for you. This Elegant Fashion Round Face Bangle Bracelet Watch is a very nice looking watch for a very attractive low price. However, the size of this watch is quite small and more suited to a very petite woman or young girl than most adult women. It would be nice if the seller gave more information about the watch so that customers could make a more informed decision. Reviews for this watch are good with the only real complaint being that this watch is incredibly small. With so many different styles and types of bracelet watches for women available today, finding one is as simple as finding a watch that fits your own sense of style and budget.